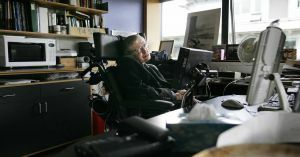 Renowned physicist Stephen Hawking passed away earlier this year, but his final book, “Brief Answers to the Big Questions,” only came out this week. “We’re probably going to need new international oversight structures, so that we don’t realize these dystopian ‘Brave New World’ examples,” said George Daley, the dean of the Faculty of Medicine at Harvard Medical School, at the International Summit on Human Genome Editing in 2015. But others play it down. “[There’s] no reason right now to be worried about self-conscious AI algorithms that set their own goals and go crazy,” Stanford machine learning lecturer Richard Socher told Fortune. And a poll of AI researchers found that most believe it will take at least 25 years to create an AI superintelligence — so at least we have a little time to prepare.